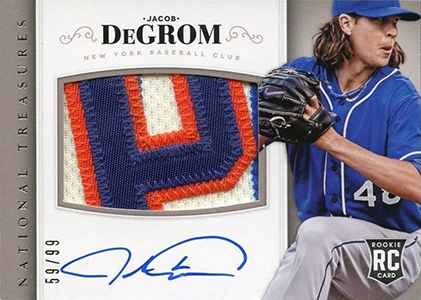 Jacob deGrom took the majors by storm in his first season, immediately making Jacob deGrom rookie cards a hot hobby commodity. Now a seasoned star for the New York Mets, he has continued his success over the years, adding the NL Cy Young Award in 2018. 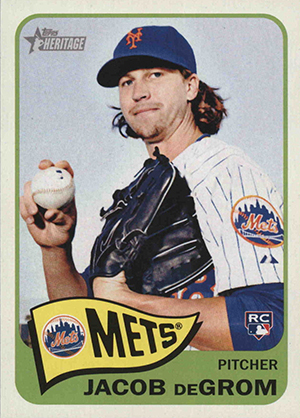 Bucking the modern trend, deGrom didn't have any major league cards until after his debut. Because he officially began his MLB career in mid-May 2014, deGrom missed the cut for the majority of 2014 releases despite winning the NL Rookie of the Year Award. 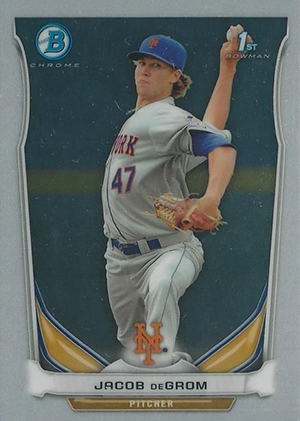 View active Jacob deGrom cards with the most bids on eBay. 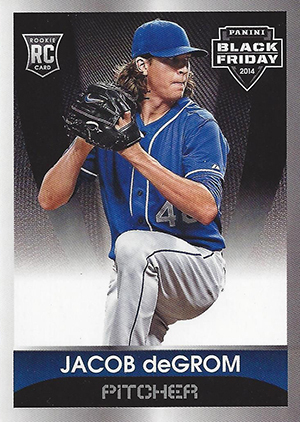 Narrowing the selection greatly, the first Jacob deGrom rookie cards didn't start showing up until late in the collecting season. As a result, there are only a handful of his RC releases to track down. 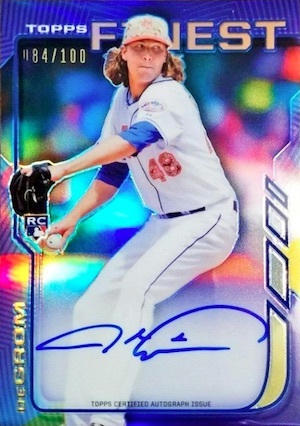 Below is a detailed look at all the Jacob deGrom rookie cards, as well as key minor league and prospect cards. Click on the card listings to shop for specific cards on eBay or to check current market values. 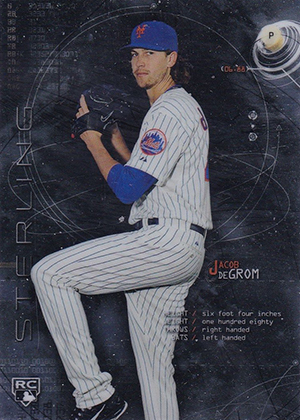 If there's a bargain among the Jacob deGrom rookie cards, this might be it. 2014 Bowman Sterling is a pricey product that delivers about four times as many autographs as base cards—and that's including base parallels. Once the initial supply dries up, Bowman Sterling base cards can often be tough to find. However, without a serial number and a lot of attention, they often slip under the radar. 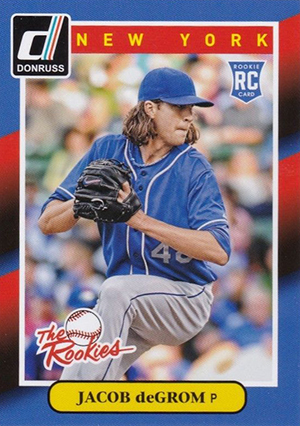 It's debatable whether this is a true rookie card as The Rookies was an insert from 2014 Donruss. However, it was later released in the small 2014 Donruss The Rookies factory set that came with an expanded checklist. Jacob deGrom is among those added players not featured in the main set. 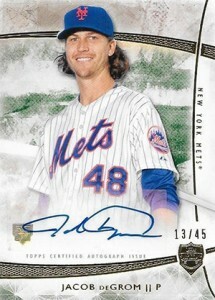 The Mets pitcher also has an autographed version. 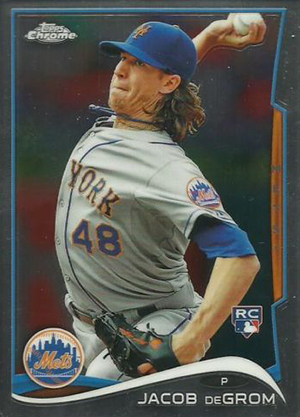 If you are really digging deep, deGrom is part of the rookie subset from the multi-sport 2014 Panini Black Friday. Due to the nature of the annual promo set and limited print run of 499 copies, the cards can be somewhat difficult to track down even though values aren't very high. 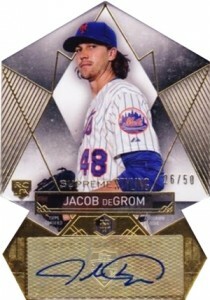 Panini's ultra-premium 2014 NT Baseball set has the rarest Jacob deGrom rookie card found with base numbering. The card displays a jumbo jersey swatch, some of which feature patches despite coming with the same numbering, and the autograph is signed on-card. 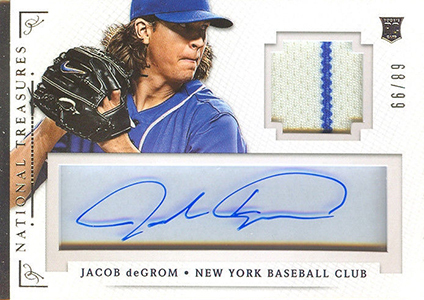 Jacob deGrom also has another autographed jersey card in the product that is numbered to 99. The Treasure Signature Materials insert has a much smaller swatch and the autograph is signed on a trapped piece of acetate. 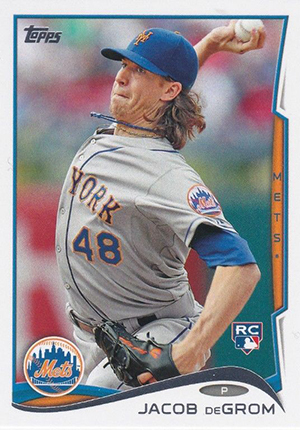 2014 Topps Update contains one of the most affordable and readily available Jacob deGrom rookie cards. If you're looking for something with a little more punch, the variation version presents deGrom in a camouflage hat. He's also got a Trajectory Autograph in the release. The 2014 Topps Chrome Update singles aren't the easiest things to find because the exclusive packs were only available in special retail value boxes. Even with a small checklist, each of the boxes has just two Chrome Update packs. The chromium card carries the same design and image as the regular Topps Update rookie. 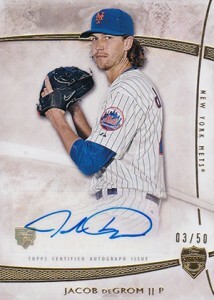 Like the main Update release, deGrom also has a Rookie Debut subset card featuring a horizontal pitching image. Mystery rookie autograph redemptions have become something of a tradition in Finest. Giving Topps the ability to add players making their debuts after the main checklists are locked, they're a tough chase. For Jacob deGrom, it has resulted in one of the most valuable cards from his rookie season, despite being issued as a redemption. The live 2014 Finest card is hard-signed and numbered to just 100 copies. Sold as factory sets, 2014 Heritage High Number Baseball contains a basic Jacob deGrom rookie card. The look is consistent with the main 2014 Topps Heritage, which is inspired by 1965 Topps. Although not exactly rare, values are decent since the cards were only issued in full sets. It is also worth noting that every box set of High Number includes one Real One autograph. 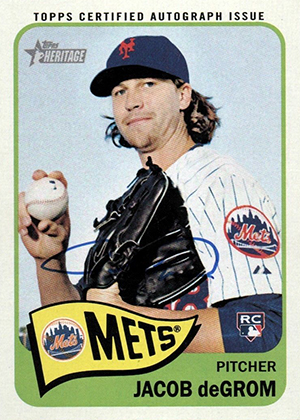 On-card signatures were a rarity for deGrom in 2014, which makes this one of the better autograph cards to consider. Be sure to check edges and corners as the boxes had little protection in the packing process. 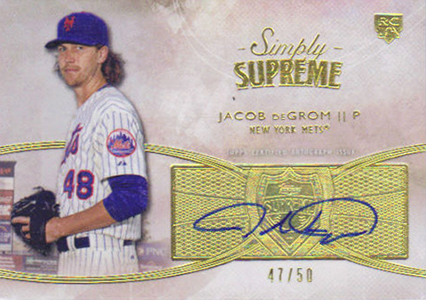 Not counting parallels, Jacob deGrom has four different sticker autograph cards in 2014 Topps Supreme: two different base autographs, a horizontal Simply Supreme card, and the die-cut Supreme Styling autograph. All four have multiple color-based parallels, so even though they are each limited to 50 copies or less, they aren't quite as rare as they seem. Nevertheless, there aren't many of these floating around online at any given time. Because it comes in the Prospects portion of 2014 Bowman Chrome, this card is by definition an insert or prospect. That said, many collectors treat it like a regular rookie card. While the basic version is on the cheap side, some of the rare Refractor parallels command significantly higher values. 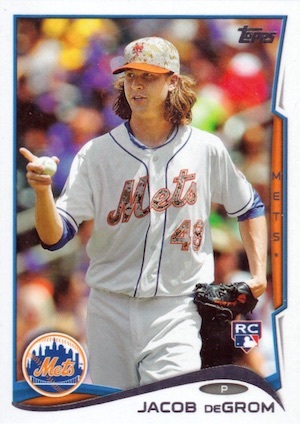 2012 is the first time Jacob deGrom appeared on an official baseball card. Like a lot of minor league sets, it's relatively tough to locate. If you can't find singles, there's always the team set route, which likely won't cost too much more than the deGrom single. 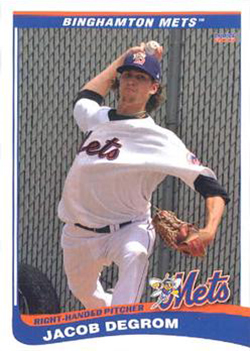 It might not be a New York Mets jersey, but the 2013 Choice Binghamton Mets minor league issue is the first card to show the pitcher with the familiar logo splashed across his chest. 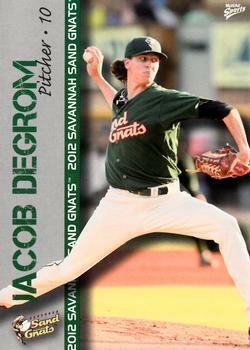 Seeing as how this is his second minor league card, it doesn't carry quite the stature as the 2012 MultiAd card.